GTFSOffline is an open source multi-agency transit app for the DIY-oriented, to access offline bus and rail schedules. It is based on GRTransit, an open source transit app for the Grand River region. Tested on Nexus 5, Android 4.4. Please send an email or open a Github issue if something doesn't work! 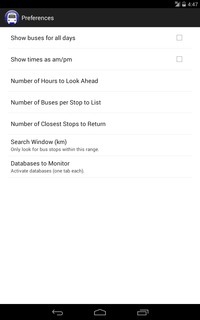 The app supports an unlimited number of these databases, and it will use the current GPS lock to find the nearest bus stops and bus times. A long-press on any of these bus stops will save them in a favourites tab. Databases known to work: GO Transit, Grand River Transit, MiWay, Metrobus, Saskatoon Transit, TTC. Permissions: only GPS is required (in theory). The app cannot communicate with the internet and does not modify external storage. It requires the external storage permission to write to its own files directory - in the interest of it being useful to more people, I require storage permissions to access the app's /files directory. One day, when everyone is on >=4.4 I will simply take that permission away. See http://github.com/wbrenna/gtfsoffline for the source code and http://wbrenna.ca/wilson/projects/gtfsoffline.php for a longer description of the app.